Dog-Day Cicada (Tibien canicularis). Delicate wings, beautiful coloring. It’s early August and the signs of summer ending are everywhere. Leaves are changing color and the frenzied call of the Dog-day Cicadas fill the afternoon air. While leaving the public library, loud raspy buzzing sounds emanating from the treetops drew my eyes to the leafy green canopy. It seemed the treetops were alive with hundreds or thousands of small bugs I couldn’t see. Walking to my car, I heard a faint flapping on the asphalt and at my feet was the white underside of a large bug. Dog-Day Cicada (Tibien canicularis). Males attract females with a loud buzzing on late spring and summer days. Photo by Donna L. Long. I flipped over the bug and was delighted by a green and bronze Art Deco pattern on the bug’s head and thorax. The delicate see-through black wings and the touches of florescent green were an artist’s color palette waiting to happen. A lovely Dog-day Cicada was right at my feet. The Dog-day Cicadas appear every year during the hot, humid stagnant air of July and August, called ‘dog-days’. This annual cicada lives in cities, suburbs and woodlands and forests. These true bugs have a simple life-cycle. The female cicada lays an egg in a slit she makes in a tree twig. The egg hatches and the small nymph comes out. The nymph drops to the ground, burrows into the Earth and spends the next 2 to 5 years sucking juices from plant roots. After 2-5 years of root-sucking, the nymphs claws to the surface, climbs a tree or other object and molts into the winged adult we see here. The adults don’t feed. Dog-Day Cicada (Tibien canicularis). Photo by Donna L. Long. It is the males which make the loud sounds on lazy summer afternoons. 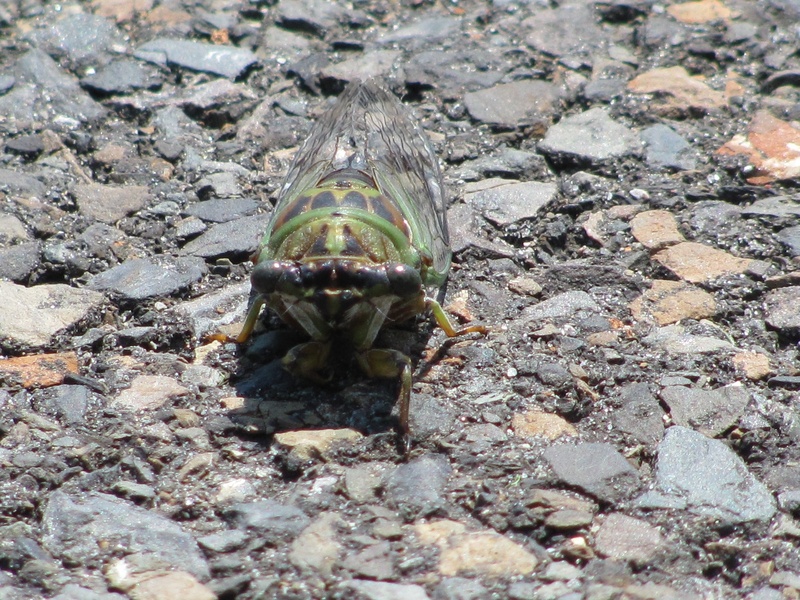 The Dog-day Cicada looks like an unlikely drummer but it is one. The male cicada produces that raspy sound from two cavities on the last segment of its’ thorax. This cavity is covered by a membrane that vibrates like a drum head. The large abdomen (last part of the body) is largely hollow and may help to amplify the sound. One male cicada making “music” attracts other male cicadas and a large number of males gather together for a jam-session. 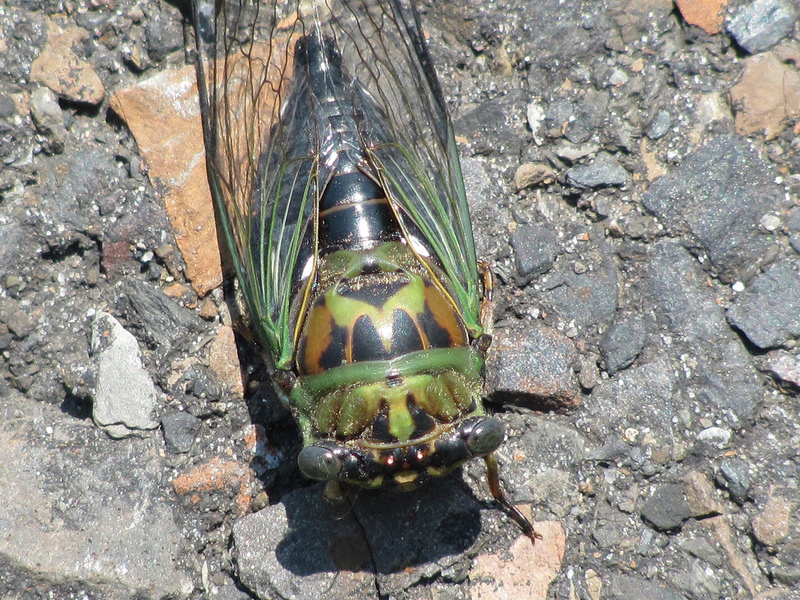 Female cicadas come from all over to the concert, choose a male(s) and mates with him (or them). This behavior doesn’t sound too different from human female groupies hanging out with rock bands. 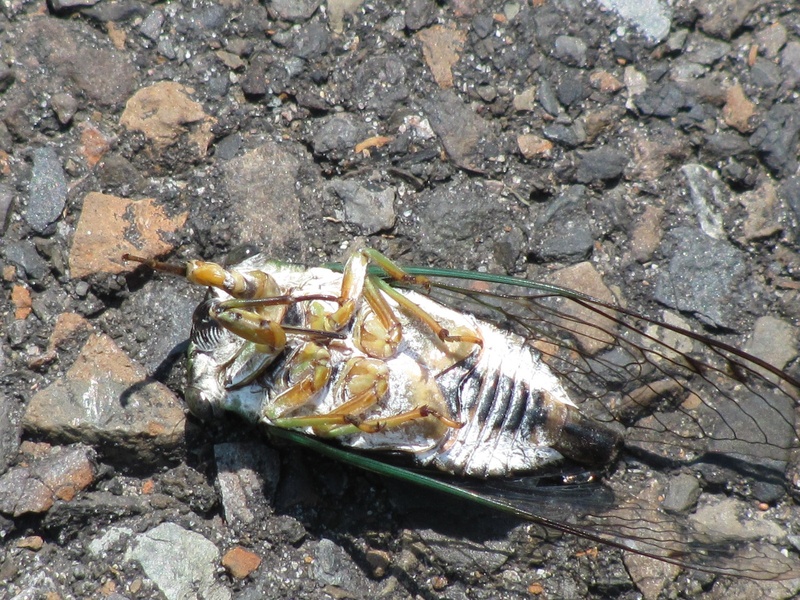 Cicadas participate in the circle of life by burrowing down and aerating the soil. And as large bugs they become food for birds, insects, spiders and other animals. Humans in many parts of the world eat cicadas, too. I guess they are crunchy with creamy centers. I would have to be really hungry to try cicada. In the meantime, I like listening to the raspy calls of males seeking females. Dog-Day Cicada adult. Photo by Donna L. Long.